FAMOSA doll company was formed by a group of toymakers in Spain in 1957. They are still going strong today as the premiere toy manufacturer in Spain and Portugal and are established in more than 50 countries around the world - USA, France, Italy. She is a doll made by Famosa and is a friend to their most famous doll toy called Nancy. 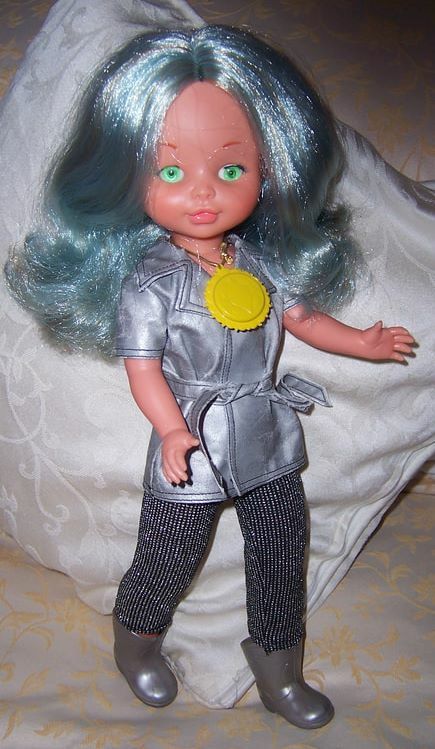 Selene was made in circa 1980 and is a space alien friend to Nancy. Selena is wearing her all original outfit which is tagged. The most unusual part of Selene is her flashing green eyes. She has a battery compartment in her back which takes 2 x AA batteries (not included) and when her magic yellow medallion with ''S'' on it is turned around it makes her green eyes flash on and off. Selene is a very cute doll.